It’s the best, most luscious and intoxicating season in India – the Monsoons. This season of rains holds the entire subcontinent in its grip and for good reason. The majority of rainfall in most of India, excluding some states in the East and the eastern coast of Tamil Nadu, will fall within this season that begins early May and finishes at the end of August. To call it a lifeline for the economy is not hyperbole, it is the truth. A poor monsoon translates into low agricultural yields and elevated prices of staples for the rest of the year. So a good monsoon is worth praying for! Besides the realities of how real-world economics of a largely agrarian economy revolve around the rains, the monsoons are a heady season, full of sensuous showers and cool evenings that call for warm food – something to give your soul a hug. 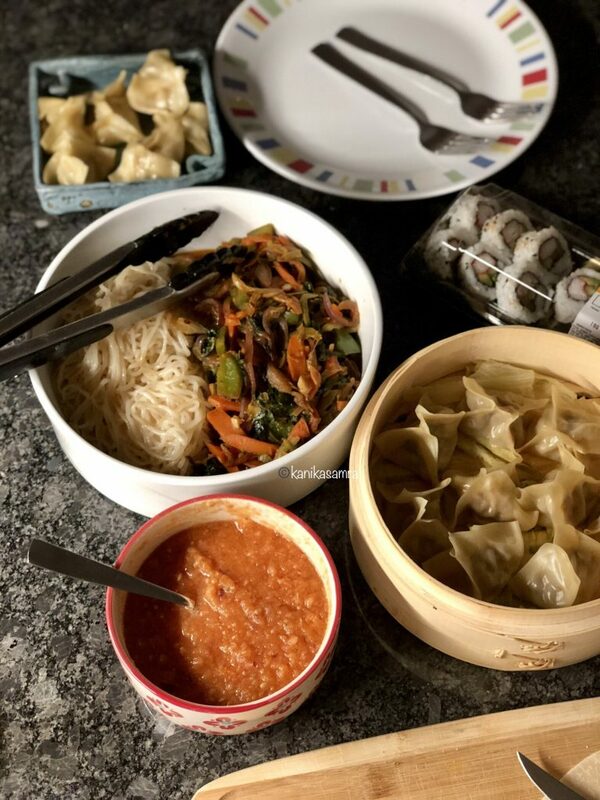 The inspiration – eating momos at a friend’s place. Pakoras are a major go to snack during the rains in India. Another that I ate repeatedly while studying in Delhi are Momos. Not sure what I mean? Let me explain. Momos are stuffed dumplings that were introduced to Indians by Nepali and Tibetan immigrants. It is so common to see a hawker selling momos in the capital New Delhi, that you’d think they were of the region. In many ways, they are now. 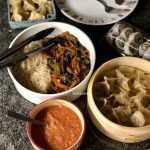 The memory of having platefuls of momos as a college student spurred me to recreate the same experience at home after having some cooked by a friend. I am extremely thankful to Sandhya – a talented designer and all round creative – for sharing her method. Each time I make dumplings I tweak things, but for the most the recipe below is my standard. Inactive prep: 20 minutes; Active cooking: 15 minutes. Fish Sauce 1/2 tsp (optional). Use store-bought egg roll/ dumpling wrappers. Bamboo steamer or perforated plate with a stand. (other options linked in the directions). Fresh Coriander – 3-4 twigs. The first step is to prep vegetables for the fillings. A dumpling gets its flavour from the filling – whether it’s all vegetables, meat or a mix of both. My preference is to create a mix with equal parts of shredded vegetables and ground chicken or turkey. For shredding vegetables, clean and pat dry celery and carrots. Then chop them into large chunks. Thoroughly wash spinach and roughly chop it. Next, peel garlic pods and also wash and peel a one inch piece of ginger root. Similarly, cube a small onion. Often in America the only small onions are shallots. That’s why I always make it a point to mention that you might need only half an onion if it’s large. If you are using green chillies, wash them then slice down the center and de-seed. Do this carefully, wash hands right away and DO NOT touch your face when working with chillies. It burns, trust me! I like to add fresh coriander in the filling for added flavour. But this is entirely optional. If you are using it, wash a handful of stems and pat dry as well. Most of the time coriander stalks are tender and I use them since they carry a lot of flavour. This is just a recommendation, decide to use the entire stem based on how you feel. If they are too thick, then just take off the leaves and discard the stems. Transfer all the vegetables, prepared above, to a food processor and pulse to shred, but not so fine that it’s a puree. Remove into a large mixing bowl and add all the seasonings. *Note: Use less salt if you want to add soya sauce, since both are salty. Use fish sauce only if you have used it before. It is an acquired taste. Shredded vegetables for dumpling filling. After the vegetables, add minced chicken or turkey, whichever you are using, to the bowl and mix well with a fork. I find that a fork helps to loosen the mince, often in long ribbons, into a thick viscous mass. While this doesn’t sound appetizing, it’s great once cooked! Set aside while you set up to fill dumplings and the steaming apparatus. All together – ground meat and vegetables for a yummy filling. Before you start filling and sealing dumpling wrappers, take a deep pot – at least 3 to 4 inches deep, add 1 cup of water to it and let it come up to a boil on medium low heat. Take out your bamboo steamer and clean it with a damp cloth. I like to oil and prepare the steamer before using it. Lining it is optional but helps keep the dumplings intact when they are removed after cooking. There are two ways to go – use lettuce leaves or paper kitchen towels. Once all this is ready turn your attention towards the dumplings. Lay out the dumpling wrappers. I have always found Nasoya Won Ton Wrapper or Egg Roll Wrappers at my local grocery store. Each of these has yielded approximately 40 momos – either in one session or in two successive ones. Once you start, decide how many you want to make and reserve the rest of your ingredients for another meal. The won ton wrappers are usually square while egg roll wrappers are rectangular. If you find rectangular long wrappers, just halve them into squares. Keep a bowl of water handy. Then take a wrapper in your palm and put about a teaspoon worth of filling in the center. Dip a finger in the water and trace a wet line all along the edges of the wrapper. Seal the edges, either lifting them up to the center to make pockets like below or any way you fancy. Make sure all the edges are sealed – that’s where the wet edges come handy. Apply more water if it’s not enough. Pockets of Flavor! 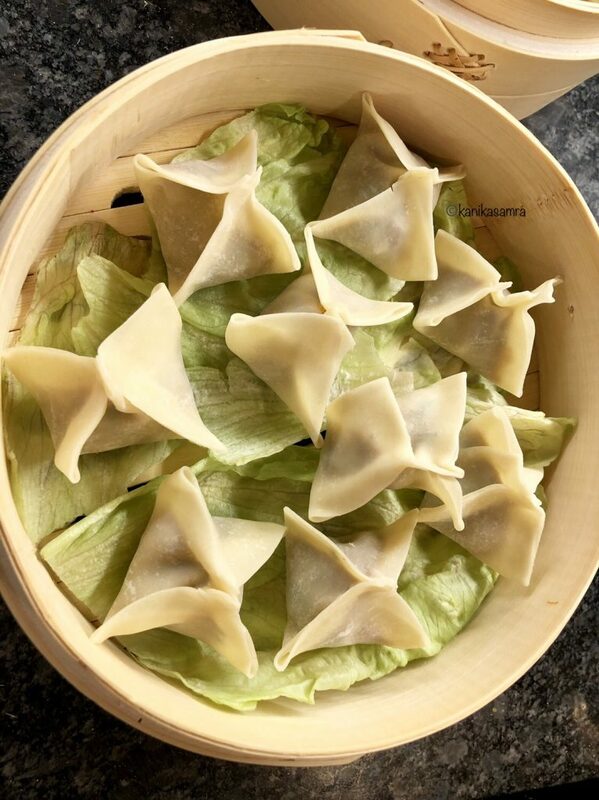 Momos ready to steam. As you finish shaping and sealing dumplings, place them in the steamer – that is just sitting on the counter not in the pot of water. Space them evenly. Then, place in the pot with boiling water and cover with the lid. Steam for about 10 minutes, which is usually enough to cook them through. Open the lid and check at the 7 or 8 minute mark. The dumpling wrapper will turn opaque so that you’ll be able to see the colour of the filling. This is a good indication that momos are ready. Repeat the steaming process with successive batches of momos. Add water to the pot if all of it vaporizes, which could if you plan to finish all the filling. 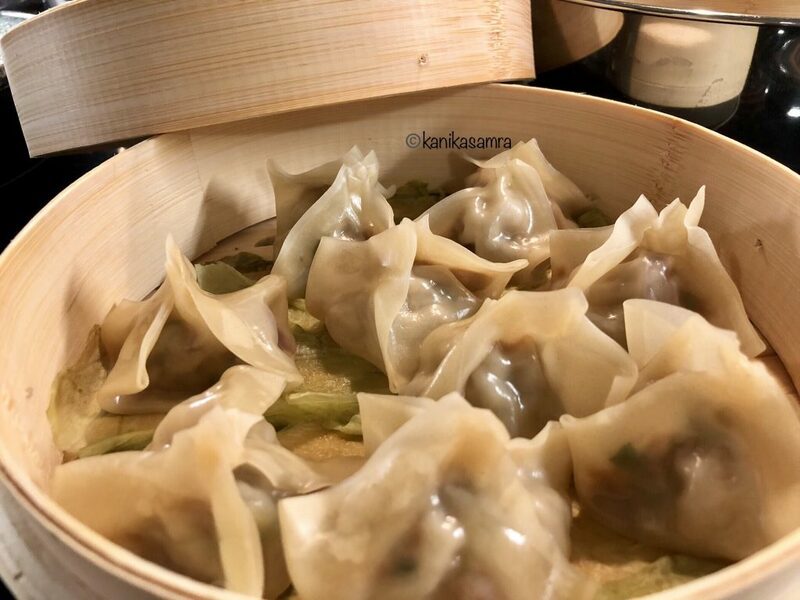 The first time I made momos at home, I did not have a steamer. So instead I boiled them. Yes, that works! An article on Serious Eats in fact recommends it for frozen dumplings. It works just as well for fresh dumplings. Put a large pot of water on the stove and bring it to a roaring boil. Add dumplings to the pot and let them cook until they float and come up to the surface. Remove with a slotted spoon and drain on a paper towel before serving. Another way is to created a makeshift steamer with a dinner plate and balls of foil. Interesting, right? Well here is an article from Food52 that will take you through various methods. The magic of this chutney, besides the heat it packs with all the red chilli used, is in the roasting. So turn on the broiler, wash the pepper and tomatoes and stick them in there to roast. This should take about 10 minutes. Turn in between to make sure all sides roast evenly. I recommend doing this while you fill and seal dumplings. 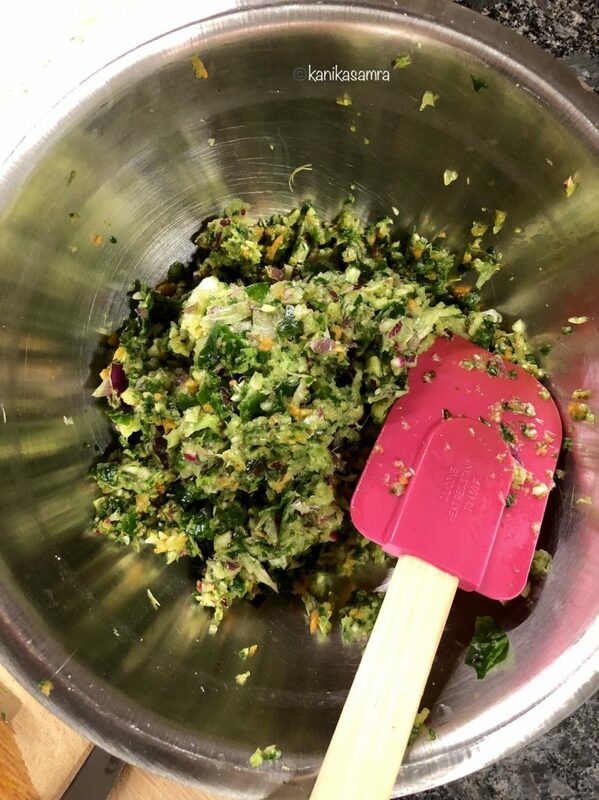 If you would rather do one thing at a time – begin with the chutney and then proceed with dumpling prep from the filling onwards. While tomatoes and pepper roast, clean and prep fresh coriander, green chillies, garlic and ginger. Slice and deseed green chillies carefully; avoid touching your face with your hands. Remove red pepper and tomatoes with tongs, and let them cool down before blending. 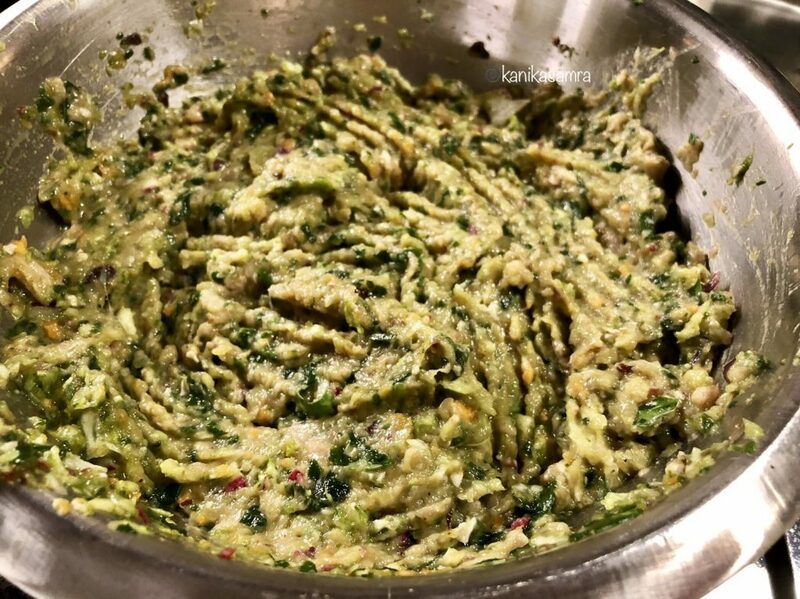 To process the chutney, add all ingredients to a blender jar and puree. Add seasoning and mix again. Adjust salt, pepper or chilli as per your taste. Pour into a bowl and serve fresh with steaming momos. 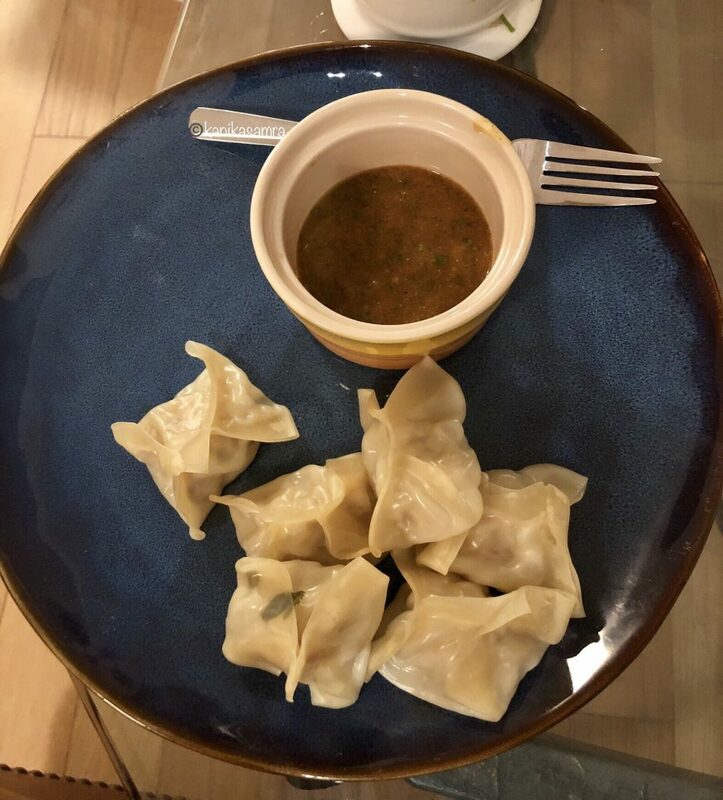 Comfort Meal Done Right – Homemade Momos and Chutney! A meal that shouts comfort! Momos are Nepali and Tibetan dumplings that are a great snack or meal on days that are cold. They are a warm hug that you will crave once you've tasted them! Use store bought egg roll/ dumpling wrappers. For shredding vegetables, clean and pat dry celery and carrots. Then chop them into large chunks. Thoroughly wash spinach and roughly chop it. Next, peel garlic pods and also wash and peel a one inch piece of ginger root. If you are using green chillies, wash them then slice down the center and deseed. If using fresh coriander, wash a handful of stems and pat dry. Transfer all the vegetables to a food processor and pulse to shred. Remove into a large mixing bowl and add all the seasonings. Add minced chicken or turkey, whichever you are using, to the bowl and mix well with a fork. Set aside while you prepare the steamer and get ready to fill dumplings. Lay out the dumpling wrappers. Take a wrapper in your palm and put about a teaspoon worth of filling in the center. Dip a finger in the water and trace a wet line all along the edges of the wrapper. As soon as enough dumplings are ready - place in the steamer, evenly spaced and steam for 10 minutes. Wash pepper and tomatoes and broil for 10 minutes or until evenly roasted. Clean and prep fresh coriander, green chillies, garlic and ginger. 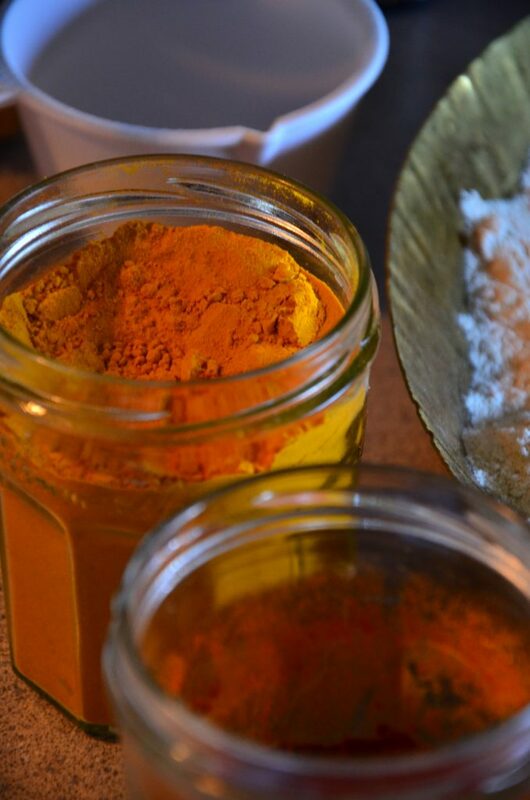 Add all ingredients to a blender jar and puree. Add seasoning and mix again. Adjust salt, pepper or chilli as per your taste. Pour into a bowl and serve fresh with steaming momos. If you are using green chillies, wash them then slice down the center and deseed. Do this carefully, wash hands right away and DO NOT touch your face when working with chillies. It burns, trust me! Use less salt if you want to add soya sauce, since both are salty. Use fish sauce only if you have used it before. It is an acquired taste. For alternative steaming methods - see the recipe. The dumpling wrapper will turn opaque so that you’ll be able to see the colour of the filling. This is a good indication that momos are ready.